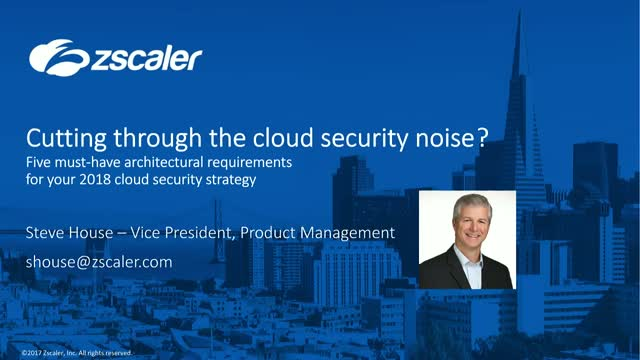 - 5 key architectural requirements your cloud security strategy can’t live without. Steve House is a seasoned Product Management leader with over 20 years of experience in the networking and security industries. During that time, he has worked for multiple market-leading organizations including Zscaler, Blue Coat Systems, Packeteer and CacheFlow where he has a consistent track record of helping them innovate and grow their market share. At Zscaler, Steve leads the Product Management team responsible for driving product strategy and execution. Steve’s goal is to help the company through its next phase of growth becoming the standard Internet security platform delivered as a service to any user on any device in any location. Steve holds a Bachelor of Science in Electrical Engineering from Duke University.